This is a photograph of a group of old colonists who settled in Patagonia 150 year ago. 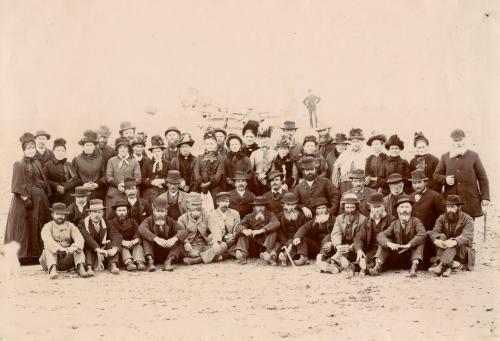 It is interesting to note that the photograph was taken on the 28th of July 1890, 25 years exactly after the first Welsh settlers arrived at Golfo Nuevo on the Mimosa. The 28th of July remains an important date in the Patagonian calendar with many celebrating “Gwyl y Glaniad”. This photograph was taken by John Murray Thomas, who sailed on the Mimosa as a boy with his sister Gwenllian and her husband, Abraham Mathews. The “Welsh in Patagonia” exhibition in Council Chamber Corridor will run until the end of the year.